When I visited the Galapagos Islands, the second island I visited was Genovesa Island, and one of the first birds I saw and photographed on the island were Swallow-tailed Gulls. 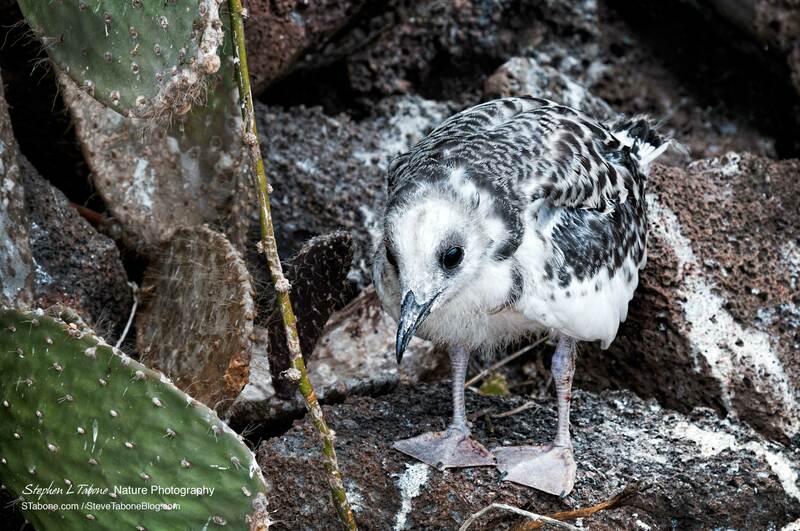 Swallow-tailed Gulls are equatorial birds that breed only in the Galapagos Islands. These gulls are unusual because they are the only fully nocturnal gull and seabird, feeding only at night when squid and small fish rise to the surface to feed on plankton. Because they are nocturnal, their eyes are very large for a gull. 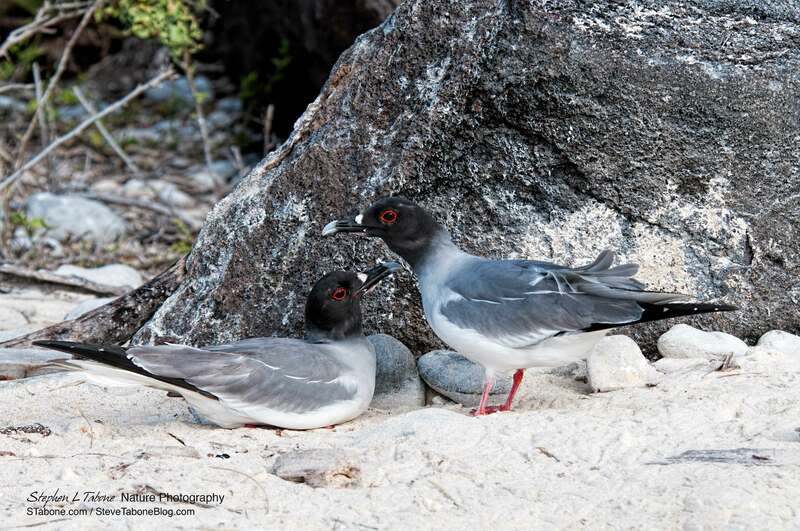 Male and female Swallow-tailed Gulls are indistinguishable, looking exactly alike. 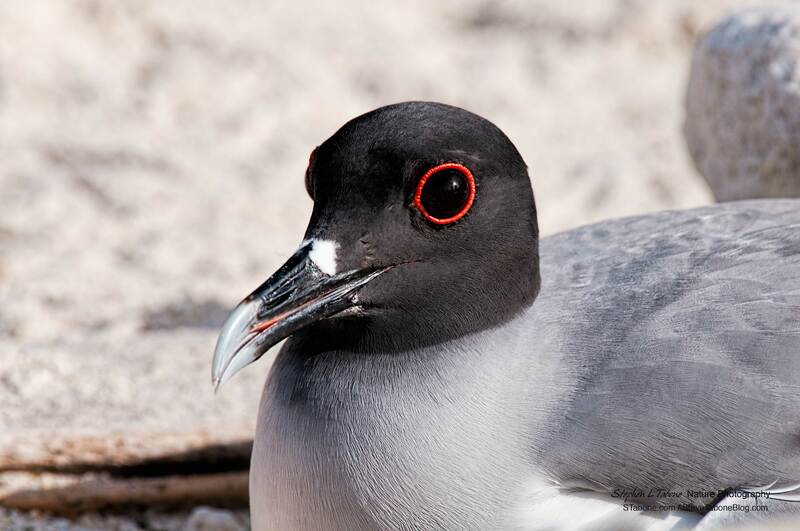 In their breeding season, their heads turn dark grey or black, and they have bright red eye rings. Normally, their heads are white and and their eye rings black. I was lucky to be there during breeding season, because not only were the gulls in their breeding plumage, but there were young gull chicks to be seen and photographed. 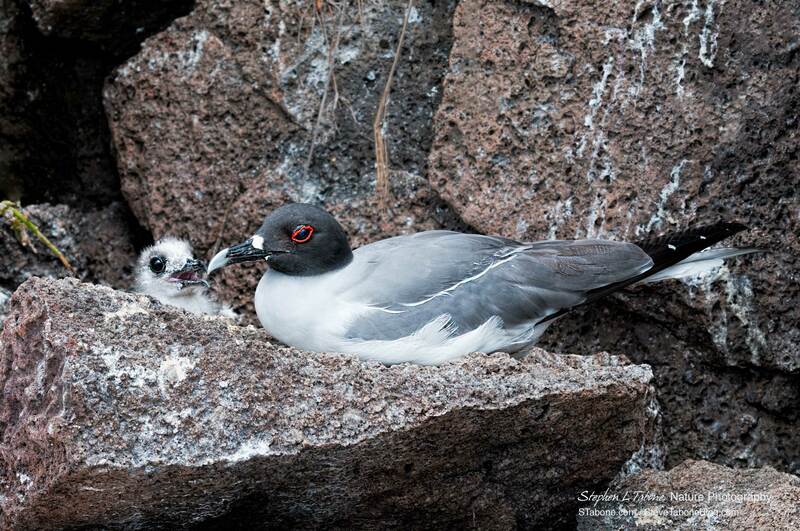 Swallow-tailed Gull eggs are incubated for 31 – 34 days. After 60 -70 days, the chicks are fully grown and take their first flight. When breeding season ends, the Swallow-tailed Gulls fly east toward the coast of South America, feeding while over the open Pacific Ocean. They return to the Galapagos to breed and typically to the same nest with the same mate within the same colony of gulls. Comments on my blog and this article are appreciated and can be entered by clicking on “Comments” found below the Share this: section. You can also read other’s comments there. 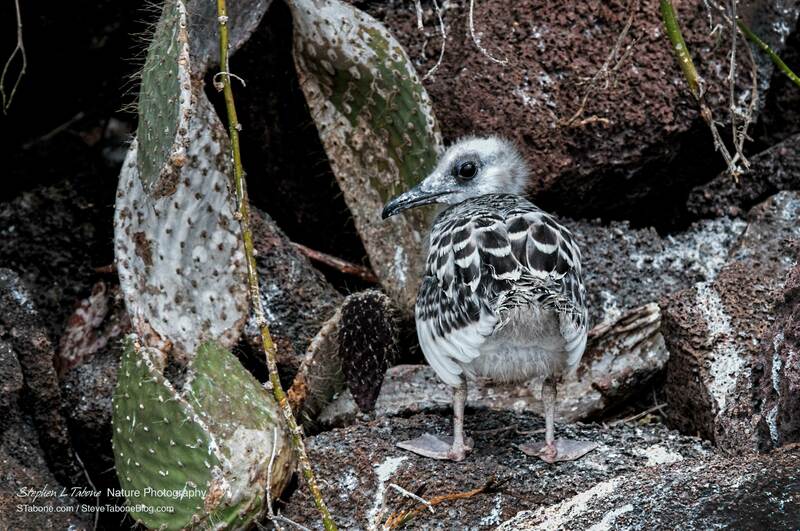 This entry was posted in Bird Photographs, Galapagos Islands, Nature and tagged Galapagods Islands, Genovesa Isalnd, Swallow-tailed Gull. Bookmark the permalink. Excellent article and images of a bird that was totally unfamiliar to me. You really took advantage of your trip with great images of a variety of animals and a lifetime of memories. Interesting article and wonderful photos. Like Ernie above, I was not familiar with this gull. It’s hard to imagine a nocturnal gull fishing at night! Wonderful Work Stephen and a very interesting subject!! Thanks Jim–you definitely need to go to the Galápagos Islands. For someone that is passionate about bird photography, the Galápagos is paradise. The birds, as well as other wildlife, are not afraid of people. Photos are so very cool. These gulls are so beautiful! Thank you for sharing! Excellent work Steve, Your Blog allows viewers to see the beauty of the places you visit and expand their knowledge through your skills as a skilled communicator.